Similar to the Camfil Glide/Pack MultiTrack 13 except the MultiTrack 25 accommodates the following filter configurations: The tracks include slide modifiers that may be moved or removed to change filter configurations to accommodate a 2” or 4” deep prefilter, a 2”, or 4” deep intermediate particulate or carbon filter, and a 6” or 12” deep rigid or pocket final filter. The Camfil Glide/Pack MultiTrack 13 is a multi-stage air filter housing with adaptable tracks to apply a variety of prefiltration and final filtration products. 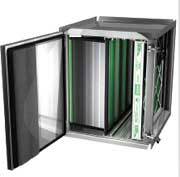 The MultiTrack 13 provides superior indoor air quality for virtually any application. The housing may also be reconfigured in the field for air filtration upgrades or to adapt to the latest air filtration technology. The aluminum filter mounting track includes ribbed surfaces to ensure that filters slide easily across the tracks in housing configurations from four high to six filters wide. The tracks include slide modifiers that may be moved or removed to change filter configurations to accommodate three 2” filters, or one 2” filter and one 4” filter. 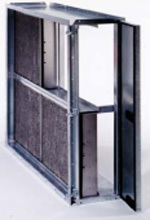 The Camfil Glide/Pack UniTrack 13 and UniTrack 25 are single stage air filter housings that provide a filter holding mechanism to ensure that the system efficiency is the same as the filter efficiency by ensuring that all system air moves through the installed filters. The base aluminum mounting track includes a ribbed surface to ensure that filters slide easily across the tracks in housing configurations from four high to six filters wide. The Camfil Diffuser/Pack® is an inline housing that removes turbulence from forced airflows and uniformly distributes the air throughout the full breadth of the air distribution system. The Diffuser/Pack is an excellent choice for those applications where component space may have been limited and where the basics of good airflow design may have been compromised. Designed primarily for the positive side of the fan, the Camfil Diffuser/Pack is installed in the same fashion as the filter housing. At 500 feet per minute face velocity the equivalent re-directional reaction is the equivalent of three duct lengths from an abrupt airflow turn. The Camfil Moisture/Pack is an inline housing that will remove mists, moisture oil or water from the airstream to protect downstream components from associated maladies. 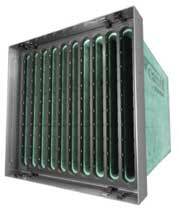 The Camfil Fast Frame is an air filter holding frame for built-up bank HVAC systems. The unique design allows for a convenient and simple filter replacement without sacrificing the integrity of the filter seal or compromising indoor air quality. Filter installation is quick and easy without the hassle of clips and fasteners associated with other systems. Typical applications may include the Camfil high efficiency Durafil® ES, Hi-Flo® ES, or any other final filter with a nominal 1-inch size header. Prefilters, such as the Farr 30/30®, or other 1,2 or 4-inch deep prefilters may be used without fasteners or clips. The Camfil Type 8 holding frame has a variety of fasteners that allow the installation of various combinations of ASHRAE prefiltration and final filtration. 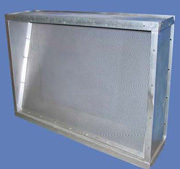 The installation may include any combinations of the following: 1", 2" or 4" deep pleated or panel filter. 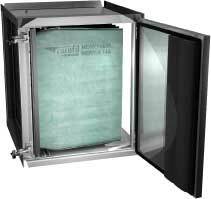 Any 6" or 12" deep rigid filter, with or without header, or pocket filter. To protect the building occupants or processes, built-up filter bank gaskets should be inspected at every filter change and replaced periodically upon evidence of degradation. This is because a leaking gasket can substantially reduce the overall efficiency of an air filter system. A ¼” gap around a full size 24” by 24” air filter will equal 18% air bypass or the equivalent of a 3” hole in the middle of the filter.